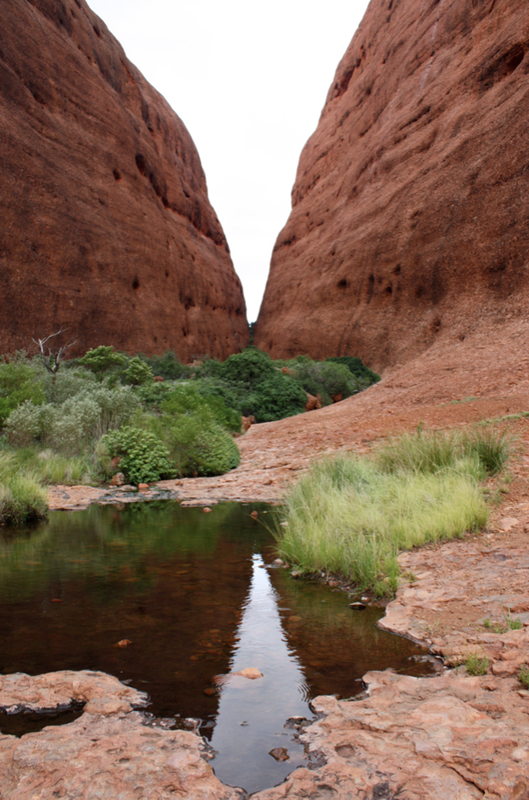 Kata Tjuta—Uluru’s impressive sister | Where to next? Kata Tjuta (The Olgas) always seems to come off as Uluru’s poorer sister—and the neglected one. Lots of people who visit Uluru, speed away before taking time to go ‘round the corner’ to see The Olgas. Surprising, because the two places are less than 50 kilometres apart. So now it’s time for a closer look at Kata Tjuta. This place—made of congomerate—is even bigger and, in many ways, more impressive than Uluru. Its 36 domes of sedimentary rock consist of cobbles and boulders. The domes cover almost 22 square kilometres, with the tallest (Mount Olga) rising more than 500 metres above the surrounding plain. Kata Tjuta is sacred under Tjukurpa and Anangu men’s law, but the public is encouraged to enjoy its sunrises, sunsets and two spectacular walks—the Walpa Gorge and the Valley of the Winds. The Walpa Gorge is just over 2 1/2 kilometres round-trip and takes about an hour. It’s a fairly easy walk, once you get past the slope at the beginning. The Valley of the Winds walk, which was partially closed when we were there this time because of high temperatures, has three parts. 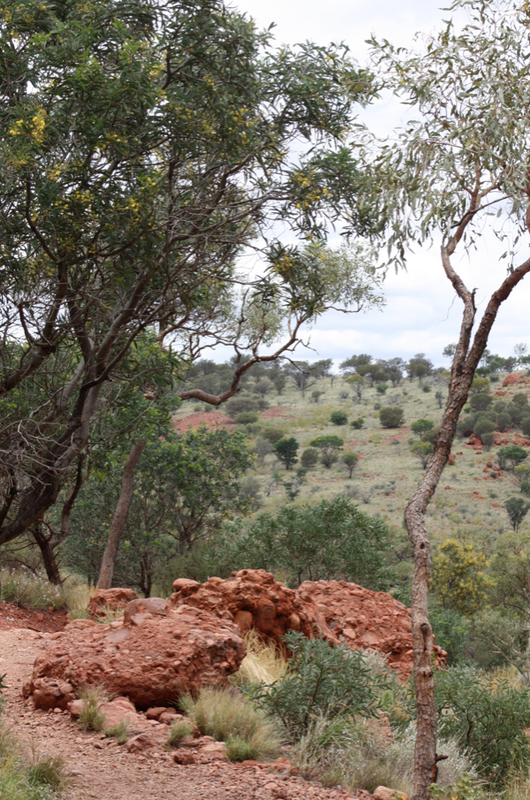 A return trip to Karu Lookout is a moderate walk that takes about an hour. The track is closed beyond this point when the temperature exceeds 36°C (97°F). The mercury range from 43–46°C (109–115°F) when we were there. But when it’s cooler and if you have up to four hours to spare, you can tackle the more difficult walks to Karingana Lookout or carry on for the full circuit of 7 kilometres. The views really are spectacular but, because of the heat, I don’t have photos from this visit. Maybe I can find some good ones from 2011. Kata Tjuta (and Uluru) are steeped in Dreamtime legends. Many relate to the great snake king, Wanambi, who is said to live on the summit of Mount Olga. Apparently he comes down only in the dry season. It was plenty dry when we were there, but he didn’t make an appearance. As an aside, in case you’re wondering about the site’s name—explorer Ernest Giles named The Olgas in 1872, to honour Queen Olga of Württemberg. This changed in 1993 when Australia adopted a dual naming policy, meaning this landmark (along with Uluru) had official names that included both the traditional Aboriginal name and the English name. For 10 years, the order of the names was English/Aboriginal, but the order was swapped in 2002. The name Kata Tjuta means ‘many heads’. Uluru–Kata Tjuta National Park is a World Heritage site. It is one of few such sites in the world to be recognised for both natural and cultural importance. If you get there, be sure to visit in the cultural centre. It has lots of interesting information and insight, simply and sensitively explained. And there’s some amazing artwork in the gift shop. Wish they allowed photos. thanks for the great photos and information. Enjoying the red cliffs of Kings Canyon | Where to next?